We're geeks. We learn things and share, right? Well, this year at WisCon I learned firsthand how to report sexual harassment. In case you ever need or want to know, here's what I learned and how it went. The mandated reporter was respectful and professional. Even though I knew them, reporting this stuff is scary, especially about someone who's been with a company for a long time, so I was really glad to be listened to. Since the incident happened during Memorial Day weekend, I was told Human Resources would follow up with me on Tuesday. There was most of a convention between then and Tuesday, and I didn't like the thought of more of this nonsense (there's a polite word for it!) happening, so I went and found a convention Safety staffer. He asked me right away whether I was okay and whether I wanted someone with me while we talked or would rather speak privately. A friend was nearby, a previous Guest of Honor at the convention, and I asked her to stay for the conversation. The Safety person asked whether I'd like to make a formal report. I told him, "I'd just like to tell you what happened informally, I guess, while I figure out what I want to do." It may seem odd to hesitate to make a formal report to a convention when one has just called somebody's employer and begun the process of formally reporting there, but that's how it was. I think I was a little bit in shock. (I kept shaking my head and thinking, "Dude, seriously??") So the Safety person closed his notebook and listened attentively. Partway through my account, I said, "Okay, open your notebook, because yeah, this should be official." Thus began the formal report to the convention. We listed what had happened, when and where, the names of other people who were there when it happened, and so forth. The Safety person told me he would be taking the report up to the next level, checked again to see whether I was okay, and then went. I had been nervous about doing it, even though the Safety person and the friend sitting with us were people I have known for years. Sitting there, I tried to imagine how nervous I would have been if I were twenty-some years old and at my first convention. What if I were just starting out and had been hoping to show a manuscript to that editor? Would I have thought this kind of behavior was business as usual? What if I were afraid that person would blacklist me if I didn't make nice and go along with it? If I had been less experienced, less surrounded by people I could call on for strength and encouragement, would I have been able to report it at all? Well, I actually know the answer to that one: I wouldn't have. I know this because I did not report it when it happened to me in my twenties. I didn't report it when it happened to me in my forties either. There are lots of reasons people might not report things, and I'm not going to tell someone they're wrong for choosing not to report. What I intend to do by writing this is to give some kind of road map to someone who is considering reporting. We're geeks, right? Learning something and sharing is what we do. So I reported it to the convention. Somewhere in there they asked, "Shall we use your name?" I thought for a millisecond and said, "Oh, hell yes." The Safety team kept checking in with me. The coordinators of the convention were promptly involved. Someone told me that since it was the first report, the editor would not be asked to leave the convention. I was surprised it was the first report, but hey, if it was and if that's the process, follow the process. They told me they had instructed him to keep away from me for the rest of the convention. I thanked them. Starting on Tuesday, the HR department of his company got in touch with me. They too were respectful and took the incident very seriously. Again I described what, where and when, and who had been present for the incident and aftermath. They asked me if I was making a formal report and wanted my name used. Again I said, "Hell, yes." Both HR and Legal were in touch with me over the following weeks. HR called and emailed enough times that my husband started calling them "your good friends at HR." They also followed through on checking with the other people, and did so with a promptness that was good to see. Corporations (and conventions with formal procedures) live and die by the written word. "Records, or it didn't happen" is how it works, at least as far as doing anything official about it. So here I was, and here we all were, with a situation where this had definitely happened before, but which we had to treat as if it were the first time—because for formal purposes, it was. I asked whether people who had originally made confidential reports could go ahead and file formal ones now. There was a bit of confusion around an erroneous answer by someone in another department, but then the person at Legal clearly said that "the past is past" is not an accurate summation of company policy, and that she (and all the other people listed in the company's publically-available code of conduct) would definitely accept formal reports regardless of whether the behavior took place last week or last year. If you choose to report, I hope this writing is useful to you. If you're new to the genre, please be assured that sexual harassment is NOT acceptable business-as-usual. I have had numerous editors tell me that reporting harassment will NOT get you blacklisted, that they WANT the bad apples reported and dealt with, and that this is very important to them, because this kind of thing is bad for everyone and is not okay. The thing is, though, that I'm fifty-two years old, familiar with the field and the world of conventions, moderately well known to many professionals in the field, and relatively well-liked. I've got a lot of social credit. And yet even I was nervous and a little in shock when faced with deciding whether or not to report what happened. Even I was thinking, "Oh, God, do I have to? What if this gets really ugly?" But every time I got that scared feeling in my guts and the sensation of having a target between my shoulder blades, I thought, "How much worse would this be if I were inexperienced, if I were new to the field, if I were a lot younger?" A thousand times worse. So I took a deep breath and squared my shoulders and said, "Hell, yes, use my name." And while it's scary to write this now, and while various people are worried that parts of the Internet may fall on my head, I'm going to share the knowledge—because I'm a geek, and that's what we do. So if you need to report this stuff, the following things may make it easier to do so. Not easy, because I don't think it's gotten anywhere near easy, but they'll probably help. ALLIES: Line up your support team. When you report an incident of sexual harassment to a convention, it is fine to take a friend with you. A friend can keep you company while you make a report to a company by phone or in email. Some allies can help by hanging out with you at convention programming or parties or events, ready to be a buffer in case of unfortunate events—or by just reminding you to eat, if you're too stressed to remember. If you're in shock, please try to tell your allies this, and ask for help if you can. NAVIGATION: If there are procedures in place, what are they? Where do you start to make a report and how? (Finding out might be a job to outsource to allies.) Some companies have current codes of conduct posted on line with contact information for people to report harassment to. Jim Hines posted a list of contacts at various companies a while ago. Conventions should have a safety team listed in the program book. Know the difference between formal reports and informal reports. Ask what happens next with your report, and whether there will be a formal record of it, or whether it will result in a supervisor telling the person "Don't do that," but will be confidential and will not be counted formally. REPORTING FORMALLY: This is a particularly important point. Serial harassers can get any number of little talking-to's and still have a clear record, which means HR and Legal can't make any disciplinary action stick when formal reports do finally get made. This is the sort of thing that can get companies really bad reputations, and the ongoing behavior hurts everybody in the field. It is particularly poisonous if the inappropriate behavior is consistently directed toward people over whom the harasser has some kind of real or perceived power: an aspiring writer may hesitate to report an editor, for instance, due to fear of economic harm or reprisal. STAY SAFE: You get to choose what to do, because you're the only one who knows your situation and what risks you will and won't take. If not reporting is what you need to do, that's what you get to do, and if anybody gives you trouble about making that choice to stay safe, you can sic me on them. Me, I've had a bunch of conversations with my husband, and I've had a bunch of conversations with other people, and I hate the fact that I'm scared that there might be legal wrangling (from the person I'd name, not the convention or his employer) if I name names. But after all those conversations, I'm not going to. Instead, I'm writing the most important part, about how to report this, and make it work, which is so much bigger than one person's distasteful experience. During the incident, the person I reported said, "Gosh, you're lovely when you're angry." You know what? I've been getting prettier and prettier. The ebook for UNFETTERED, which contains the A MEMORY OF LIGHT deleted sequence "River of Souls," has now been released. Details below. Tor.com's reread of THE WAY OF KINGS reached chapters 16 and 17, the first flashback with Laral and Tien, and Kaladin leading Bridge Four from the front. Also, Writing Excuses' latest podcast episode features us talking about middle grade fiction with E.J. Patten, author of RETURN TO EXILE and THE LEGEND THIEF. If you haven't heard about UNFETTERED before, here's a bit of an introduction. When I was on tour probably for THE ALLOY OF LAW, Shawn Speakman (webmaster for Terry Brooks and Naomi Novik, and who also runs the booksigning service The Signed Page), approached me about an anthology he was putting together (at the suggestion of Terry Brooks) to help defray Shawn's medical bills stemming from his 2011 diagnosis with Hodgkin's lymphoma. Shawn has been a friend and supporter to the careers of a lot of writers, so I was interested in helping out. The question was what to contribute to the anthology. The title Shawn gave it was UNFETTERED, because he didn't want to put any restrictions on whatever the authors wanted to contribute. When I was writing A MEMORY OF LIGHT, there was a sequence of viewpoints I was working on that were somewhat more daring than some other viewpoints I had done. The character I'm talking about is known as Bao in the book, and if you've read it you'll know who that is. I wanted to try to give some deeper backstory to Bao, but after I showed the scenes to Harriet, though we all liked them, we decided they they didn't fit in the book. Harriet felt that these scenes were distracting and derailing the narrative too close to what was to be the climax of the entire series, because of the new elements I was adding and fleshing out. So after some discussion, we decided that they should be cut. Though I saw the need for this, the fact that this was necessary left me feeling kind of sad. I felt the scenes were strong and added a lot to the character, giving a lot of extra motivation and poignancy to some of the things going on in A MEMORY OF LIGHT. So when the opportunity for Shawn's anthology came along, I began to think this would be the place for them. I approached Harriet, and she said that was a good idea. The result is "River of Souls," labeled as a Wheel of Time tale by Robert Jordan and Brandon Sanderson. Since it's actually a sequence of deleted scenes, it's meant to be read as a companion to your read of A MEMORY OF LIGHT. It's not going to make a whole lot of sense if you haven't read at least the rest of the Wheel of Time, but it's a complete arc and I find it very exciting. I think you'll really like it, and I think this anthology is a good place for these scenes because they won't be distracting from the rest of the story. 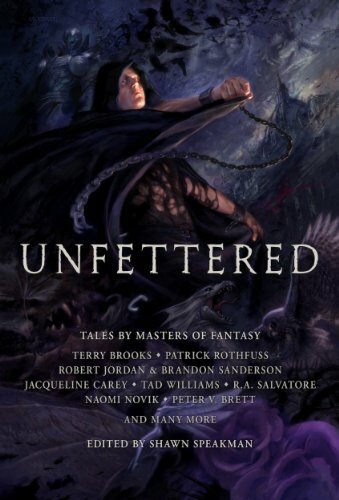 UNFETTERED also has stories from lots of other wonderful writers in it. I'm honored to have a story in there, to be alongside the names that appear in this anthology. It's great to see so many people pulling together to support someone in the community, and I wish Shawn the best. The anthology is available now in ebook form, and as a hardcover direct from Shawn's Grim Oak Press website. He'll be shipping books out over the next three weeks (he has a very small operation and it will take him time to get through so many orders). Also note that the long-sold-out special edition signed by every single author will take even more time to deliver. The signing pages are currently being shipped around the country from author to author for all of us to sign, and that will take a while. Once all of those are back with Shawn, the pages will be bound into the books, which will then be delivered. If you missed it, here's the video where I explain my part in this anthology. This week the Writing Excuses podcast has a "project in depth" episode on Mary Robinette Kowal's novella "Kiss Me Twice," which was nominated for the Hugo and Nebula last year. Give it a listen, though you'll probably want to read the novella first. Tor.com had a couple of The Way of Kings articles last week. First was one on the ecology of Roshar, and then their reread reached chapter fifteeen. Every June, publishers like to highlight audiobooks. This year they're doing it with the hashtag #ListenLit on Twitter. All of my books are now out in audio editions. There are two different kinds of audiobooks of mine that have come out: standard unabridged readings (from Macmillan Audio, Recorded Books, and Audible) and full-cast dramatizations (from GraphicAudio). Which type each book has depends on how contracts were negotiated. 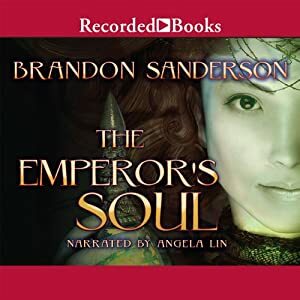 Recorded Books has unabridged readings of Elantris, Warbreaker, The Emperor's Soul, and all four Alcatraz books. GraphicAudio has full-cast dramatizations of Elantris and Warbreaker. They've also recently acquired rights to give the same treatment to Mistborn trilogy but I don't know when those will be coming out. Amazon has most of the above for sale. Audible has everything except for the GraphicAudio editions, and they are also the publisher of the audiobook for Legion. iTunes also has many of the books. Tor.com has a free unabridged reading of the novelette "Firstborn" (see the "Listen" link in the left column). ALCATRAZ VERSUS THE SHATTERED LENS has now been released in the UK (and presumably also in Australia and New Zealand). That means all four books are now out, and since they all came out this year, it should be relatively easy to find them on shelves and in ebook form. (Note that all four books are still out of print in the US, though the audiobooks ARE currently available in the US.). The most recent Writing Excuses episode is a microcasting episode touching on the following questions. Give it a listen! What's your first step in the rewriting process? How do you write Artificial Intelligences as characters? Tactful promotion: how do you get nominated for a Hugo or Nebula? How do you decide whether or not to take an offer from a publisher? Do you use a writing notebook? How, and for what? What methods do you use to test the "coolness" and/or viability of a story idea? What genre or style do you read that is outside of the one(s) in which you write? Tor.com's reread of THE WAY OF KINGS continues with chapters 13 and 14, the battle with the chasmfiend and Kaladin's first attempt to change Bridge Four. Tor made a book trailer for THE RITHMATIST (which is out now). Enjoy! There's also a cool Kickstarter campaign (well past its goal, ending in two days) from Cryptozoic Entertainment for a digital TCG/MMO called HEX. The developers of the (targeted for fall 2014) MISTBORN: BIRTHRIGHT video game, Little Orbit, are working on this game with Cryptozoic. My congratulations to all of them for such a successful Kickstarter!